The SSD is a 2.5-inch Serial Attached SCSI (SAS) SSD and claims to offer 400MB/s read/write speeds. American multinational corporation SanDisk, which designs and develops flash memory storage solutions and software, has developed world's first 4TB SSD named Optimus MAX SSD. Solid state drives are usually manufactured in smaller storage capacities for consumer use. By launching Optimus MAX SSD, SanDisk wants to target the enterprise market by offering enterprises to maintain their current SAS storage infrastructures while providing fast and cost-effective performance. SSD usually produce less heat and consume lower power than HDDs. SanDisk claims that Optimus MAX SSD provides read/write speeds of up to 400MB/s of up to 75,000/15,000 I/O operations per second (IOPS) via its 6Gb/s interface. The company is targetting the drive at read-intensive applications required in data warehouses, media streaming, web servers, video-on-demand (VOD) and web-based applications. 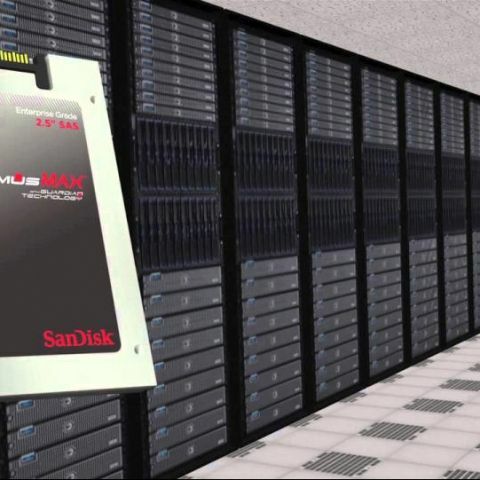 John Scaramuzzo, Senior Vice President and General Manager, Enterprise Storage Solutions at SanDisk says, "We believe that the Optimus MAX will be a disruptive force within the storage industry, catalyzing many organizations to make the switch from their HDD-prominent data center infrastructures to SSDs." SanDisk is yet to reveal the pricing of the SSD. The Optimus MAX SSD and renewed Optimus family of drives will be available with TCG Enterprise Security Subsystem Class compliance to select OEMs and through the channel in Q3-2014. It will also come with a 5-year limited warranty. I want to Buy SSD hard drive under 10k ?